While you can pore over hundreds of pretty hairstyles and think of getting something that looks great on your favorite celebrity, do consider if it will match your face shape and bone structure. A mistake that most women do is trying to emulate a hairstyle seen on others without giving due consideration to the shape of their face. Each face shape has some hairstyles that will suit it. Today, we tell you some hairstyles for oblong faces. Women with oblong face shape are slightly different from those with oval faces. Oblong faces have a large forehead and prominent cheek bones. The key is to get a hairstyle that will make your hair look slightly wider than it is, to give an illusion of cutting down on the length of the face. Bangs are a great way to cover up the forehead. Lets see what some of the hairstyles that suit oblong faces are. The extra long bangs, which when swept to a side reach your jaws, can not only help cover a large forehead, but also attract attention away from it. The layers in the hair, that start at the jaws help give an illusion of fuller cheeks and a rounder face. It also creates more volume around the crown. This hairstyle that ends just above the shoulders will create a lot of movement around your face and frame it in such a way that the length of the face is not apparent. The streaks in the hair, especially the bangs on the forehead with the highlights adds a lot of sparkle to the entire look. Liv Tyler’s face is as oblong as it gets. She wears her hair beautifully to complement her face cut. Her center partition adds width to the face while her soft brunette wavy hair makes her face appear fuller and rounder. The hair is cut in layers in the sides and at the back. Trim the hair regularly to maintain the layers at the chin length. 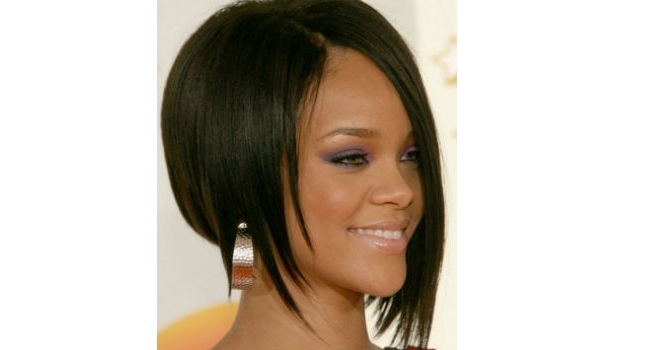 If you want to keep your hair short, then this pixie hairstyle is perfect for an oblong face. The fringe and the sideburns add width to the face and drag the attention to the sides of the face. The focus goes away from the length of the face and is directed to your eyes and cheeks.This way, the face does not appear too long and you can carry on a stylish low maintenance look. Nothing adds more volume to oblong faces as much as curly hair. Make sure that you don’t increase the volume on the crown as it will elongate your face even more. Try to keep your crown hair as flat as possible and add lot of curls and highlights to the body of the hair. You can add a sideswept bang if you are in for it to add more girth to your face. This modern haircut has asymmetrical lines that help in drawing attention away from the shape of the face by balancing its length. The diagonal fringe from the forehead to the chin adds breadth to the face.